Sunday night, as part of the 2nd annual Celebrity Fight Night In Italy, Sharon Stone and Reba McEntire were honored with the Andrea Bocelli Humanitarian Awards onstage during the featured gala in the historical Salone dei Cinquecento at the Palazzo Vecchio. Andrea Bocelli, along with the extraordinary orchestra of Maggio Musicale Fiorentino under the direction of the greatest living conductor Maestro Zubin Mehta, headlined the evening. 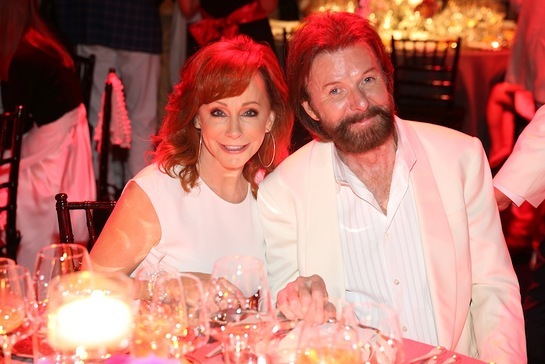 Additional guests at the gala, and participating in the 5 day philanthropic trip, included Ronnie Dunn, The Band Perry, David Foster, Larry King, Leona Lewis, Jackie Evancho, Zubin Mehta, 2CELLOS, David Garrett, Jo Champa, Maria Katzarava, Carly Paoli, and Raphael Gualazzi. After finding success in its first year, “Celebrity Fight Night in Italy” with Andrea Bocelli returned for a second turn, this year taking philanthropic donors and special guests through Florence and Rome, where they were treated to the very best arts, entertainment and culture in the region. This year’s event raised $12.5 million to benefit The Andrea Bocelli Foundation and The Muhammad Ali Parkinson Center.